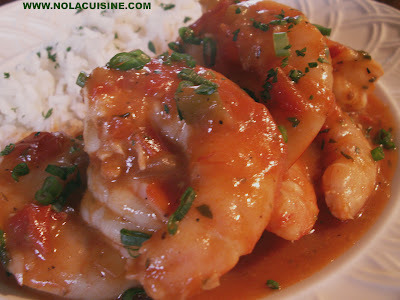 Check out my post and recipe for Shrimp Creole over at my main site Nola Cuisine. Shrimp Creole is one of the classic New Orleans shrimp dishes when properly prepared. I like to use homemade Shrimp stock to make the sauce, as in my Shrimp Etouffee recipe. Also, be sure to check out my ever growing Index of Creole & Cajun Recipes, which links to all of the recipes featured on Nola Cuisine! Hello from NY! I am happy to find your blog. I visited New Orleans for the first time last fall and absolutely fell in love with the city, people, and food! I will enjoy looking at all your recipes and attempting to make some. Eelegant blog, I've used your soft shell crab a couple of times-just marvelous. I've posted a picture of my version on my blog Kitchen Inferno if you're interested-giving you full credit of course. The shrimp creole looks delish! I am no seafood lover, but that creole of yours is just one big flirt! Nothing beats the food in new orleans. Fell in love and 10 years later still crave it.